The surgical reduction of hyperopia is an evasive but worthy pursuit since hyperopia affects both distance vision and near vision and is compounded by presbyopia at a time when patients are in the prime of their vocational and personal life. A wide spectrum of refractive surgeries has been applied over the years in the relentless pursuit of hyperopia correction. With the introduction of the excimer laser, the possibilities of carving a positive lenticule into the cornea were investigated. [1, 2, 3, 4] To steepen an untreated corneal center, it is necessary to have a relatively deep peripheral ablation, with a progressive steepening of the transition of zone 1. Corneal topography with central uniform steepening following hyperopic LASIK. See related CME at Highlights of the American Society of Cataract and Refractive Surgery Symposium. Three acrylate polymer masks of diameters 4.5 mm, 4 mm, and 3.5 mm, respectively, were designed and custom-made by Gulani as shown below. The surface of the masks was spherical, convex for hyperopia correction. The edges were thinned out evenly to a smoothly polished finish. These masks were centered on the exposed corneal stroma between the laser beam and the eye, successively starting with the 4.5-mm mask, followed by the 4-mm mask, and, finally, the 3.5-mm mask, to allow the final ablation pattern to reveal a central graduated steepening comprised of 3 concentric rings. The lenses were transparent with a green tint to allow for maximum light penetration by the green fixation light on the laser. Each lens was +2.5 D in power to aid fixation by the patient with hyperopia. See the image below. A specially designed triple zone marker and lens placement forceps (designed by Gulani) were used with these lenses during surgery. The principle behind designing these lenses stemmed from a desire to improve patient fixation and surgeon visibility of the ongoing procedure. Prior to the use of these masks, aluminum masks of the same base diameters, respectively, were used. Since these masks were not transparent, the patients could not see the fixation light and had a tendency to wander unless closely held by the globe fixator (designed by Gulani). Also, the surgeon could not see the corneal stroma under these masks; therefore, they had no active role to play in centration of the final concentric ring ablation pattern. 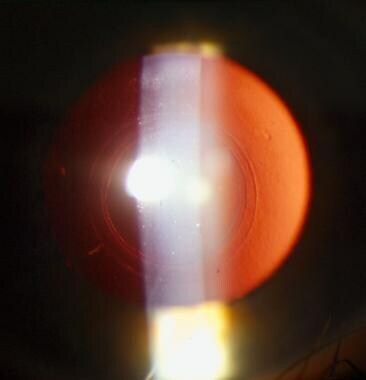 Making these lenses out of a transparent material helped both the surgeon and the patient and resulted in a well-controlled, supervised, and predictable hyperopic laser corneal sculpting as depicted below. Now, the surgeon could center these lenses and maintain direct observation during laser ablation. See the image below. Transparent lenses on the patient's corneal stroma allowed visualization of the fixation light. The green tint of the lenses maximized the unimpeded passage of the green fixation light into the patient's eye, helping the patient to visualize and fixate on this light in maintaining consistent centration. Patients with hyperopia have a difficult time visualizing the fixation light due to their farsightedness. Incorporating a spherical power of +2.5 D into these lenses dramatically improved their ability to clearly visualize and fixate. All of the above features helped to improve patient fixation and to decrease anxiety, enabling a well-centered hyperopic corneal sculpting with consistent results. Hyperopia generally is due to a shorter axial length or reduced corneal dioptric strength. Various figures are given, but, generally, it is believed that hyperopia affects millions of individuals in the United States. Hyperopia may run in families. A primary finding is a reduction of vision. Near or distance vision can be affected depending on age and refractive error. With proper correction, the vision is good. Clinical picture (retroillumination) showing the 3-ring ablation pattern following hyperopic LASIK. This article is limited to a discussion of LASIK for virgin eyes with hyperopia of less than 6.00 D and coexisting astigmatism of less than 0.75 D and the impact of the new intra-ablative lenses on the same eyes. With hyperopia, the axial length is generally shorter or the corneal dioptric strength is weaker. Contraindications for LASIK include lupus erythematous and rheumatoid arthritis. Trokel SL, Srinivasan R, Braren B. Excimer laser surgery of the cornea. Am J Ophthalmol. 1983 Dec. 96(6):710-5. [Medline]. Waring GO 3rd. Development of a system for excimer laser corneal surgery. Trans Am Ophthalmol Soc. 1989. 87:854-983. [Medline]. Gulani AC. Excimer laser beam profile topography. Corneal Topography. Slack, Inc; 2005. 173-181. L'Esperance FA, Taylor DM, Warner JW. Human excimer laser keratectomy: short-term histopathology. J Refract Surg. 1988. 1:118-24. Seiler R, Kahle G, Kriegerowski M. Excimer laser (193 nm) myopic keratomileusis in sighted and blind human eyes. Refract Corneal Surg. 1990. 6:165-73. Dausch D, Klein R, Schroder E. Excimer laser photorefractive keratectomy for hyperopia. Refract Corneal Surg. 1993 Jan-Feb. 9(1):20-8. [Medline]. Marshall J, Trokel S, Rothery S, Krueger RR. Photoablative reprofiling of the cornea using an excimer laser, photorefractive keratectomy. Lasers Ophthalmology. 1986. 1:21-48. McDonald MB, Liu JC, Byrd TJ, et al. Central photorefractive keratectomy for myopia. Partially sighted and normally sighted eyes. Ophthalmology. 1991 Sep. 98(9):1327-37. [Medline]. 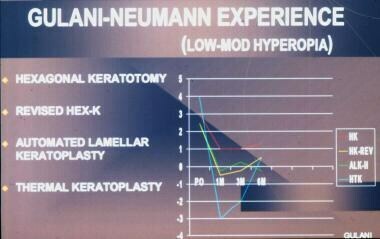 Seiler T, Wollensak J. Myopic photorefractive keratectomy with the excimer laser. One-year follow-up. Ophthalmology. 1991 Aug. 98(8):1156-63. [Medline]. Ditzen K, Huschka H, Pieger S. LASIK for hyperopia. Burrato L, ed. LASIK Principles and Techniques. Slack, Inc; 1998. Vol. 22: 269-75. Osama I. Laser in situ keratomileusis for hyperopia and hyperopic astigmatism. J Refract Surg. 1998. 14:181. Gulani AC. Corneoplastique™. Techniques in Ophthalmology. 2007. 5(1):11-20. Gulani AC. Future directions in LASIK. Corneal Refractive Surgery. Video Atlas of Ophthalmic Surgery. XLV. 2008. Gulani AC. What's new in refractive surgery?. Review of Ophthalmology. 1997. 79-81. Gulani AC, Holladay J, Belin M, et al. Future technologies in LASIK- Pentacam advanced diagnostic for laser vision surgery. Experts Review of Ophthalmology. London: In press; 2008. Gulani AC. Pentacam technology in LASIK. Corneal Refractive Surgery. Video Atlas of Ophthalmic Surgery. XVII. (2). 2008. Gulani AC, Probst L, Cox I, et al. Zyoptix: the Bausch & Lomb wavefront platform. Ophthalmol Clin North Am. 2004 Jun. 17(2):173-81, vi. [Medline]. Gulani AC. LASIK in four types of ametropia. Ann Ophthalmol. 1998. 30:135-6. Gulani AC, Alio J, et al. Abnormal preoperative topography in refractive surgery complications. Cataract and Refractive Surgery Today. 2007. 7(2):37-42. Gulani AC. Its a matter of control: The Gulani LASIK globe stabilizer and flap restrainer. Asico Vision News. 1998. 5:1:1-2. Soler V, Benito A, Soler P, et al. A randomized comparison of pupil-centered versus vertex-centered ablation in LASIK correction of hyperopia. Am J Ophthalmol. 2011 Oct. 152(4):591-599.e2. [Medline]. Antonios R, Arba Mosquera S, Awwad ST. Hyperopic laser in situ keratomileusis: Comparison of femtosecond laser and mechanical microkeratome flap creation. J Cataract Refract Surg. 2015 Aug. 41 (8):1602-9. [Medline]. Saib N, Abrieu-Lacaille M, Berguiga M, Rambaud C, Froussart-Maille F, Rigal-Sastourne JC. Central PresbyLASIK for Hyperopia and Presbyopia Using Micro-monovision With the Technolas 217P Platform and SUPRACOR Algorithm. J Refract Surg. 2015 Aug. 31 (8):540-6. [Medline]. Gulani AC, McDonald M, Majmudar P, et al. Meeting the challenge of post-RK patients. Review of Ophthalmology. 2007. 4(10):49-54. Gulani AC, Probst L. Cons of presbyopic LASIK. LASIK: Advances, Controversies & Custom. Slack, Inc; 2004. 32B: 367-9. Neumann AC, Gulani AC. Lamellar surgery: counterpoint and complications. Elander R, ed. Textbook of Refractive Surgery. WB Saunders; 1997. Vol. 24: 291-7. Gulani AC, Neumann AC. LASIK gets good results with difficult hyperopia cases. Ophthalmol Times. 1997. 22:13. Plaza-Puche AB, Yebana P, Arba-Mosquera S, Alió JL. Three-Year Follow-up of Hyperopic LASIK Using a 500-Hz Excimer Laser System. J Refract Surg. 2015 Oct 1. 31 (10):674-82. [Medline]. Schallhorn JM, Schallhorn SC, Ou Y. Factors that influence intraocular pressure changes after myopic and hyperopic LASIK and photorefractive keratectomy: a large population study. Ophthalmology. 2015 Mar. 122 (3):471-9. [Medline]. Zabel RW, Sher NA, Ostrov CS, et al. Myopic excimer laser keratectomy: a preliminary report. Refract Corneal Surg. 1990 Sep-Oct. 6(5):329-34. [Medline]. Gulani AC. Principles of surgical treatment of irregular astigmatism in unstable corneas. Irregular Astigmatism: Diagnosis and Treatment. Thorofare, NJ: Slack, Inc; 2007. 251-261. Hersh PS, Schwartz-Goldstein BH. Corneal topography of phase III excimer laser photorefractive keratectomy. Characterization and clinical effects. Summit Photorefractive Keratectomy Topography Study Group. Ophthalmology. 1995 Jun. 102(6):963-78. [Medline]. Hersh PS, Shah SI. Corneal topography of excimer laser photorefractive keratectomy using a 6-mm beam diameter. Summit PRK Topography Study Group. Ophthalmology. 1997 Aug. 104(8):1333-42. [Medline]. Lin DT, Sutton HF, Berman M. Corneal topography following excimer photorefractive keratectomy for myopia. J Cataract Refract Surg. 1993. 19 Suppl:149-54. [Medline]. Mertens E, Gulani AC. Post-LASIK corneal ectasia. Mastering the Techniques of Customized LASIK. J.P. Publishers; 2007. 31: 284-293. 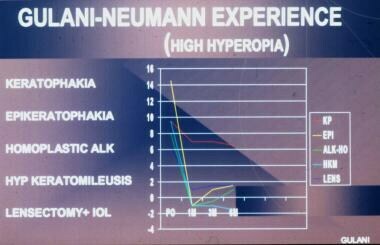 Gulani AC, Mertens E, Karpecki P. Indices for corneal ectasia in LASIK surgery. 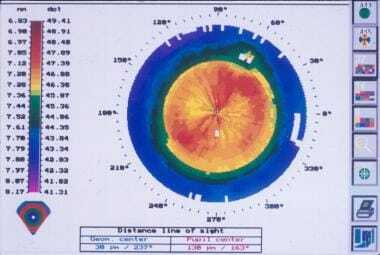 Corneal Topography. Slack, Inc; 2005. 173-181. Gulani AC. Refractive tool time. LASIK flap instruments: the rush is on. Eyeworld. 1997. 2:38. Gulani AC. Piggyback intraocular lenses. Ann Ophthalmol. 1998. 30:205-6. Gulani AC, Wang M. Future of corneal topography. Corneal Topography in the Wavefront Era. Thorofare, NJ: Slack, Inc; 2006. 26: 303-304. Dierick FL, Missotten T. Is the corneal contour influenced by a tension in the superficial epithelial cells? a new hypothesis. Refract Corneal Surg. 1996. 8:54-9. Gulani AC, et al. Innovative real-time illumination system for LASIK surgery. Journal of the Canadian Society of Cataract and Refractive Surgery. 2003. 1/21, 6:244-6. LASIK lens on the corneal stroma during laser ablation. Disclosure: Received grant/research funds from Alcon Labs for independent contractor; Received grant/research funds from Abbott Medical Optics for independent contractor; Received ownership interest from Acufocus for consulting; Received ownership interest from WaveTec for consulting; Received grant/research funds from Topcon for independent contractor; Received grant/research funds from Avedro for independent contractor; Received grant/research funds from ReVitalVision for independent contractor.